The Rosewood Boredom Breaker Activity Toy Cargo Net is ideal for rats, degus, ferrets, chinchillas and chipmunks.. Join two or more together to create the ultimate assault course for your small animal! Climbing and clambering fun for small furries, provides your pet with physical and mental stimulation. Hints & Tips. 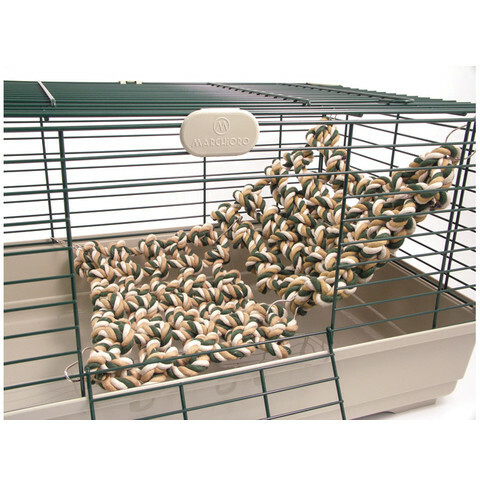 Your Cargo Net can be hung in your pet's cage in three ways: *from one side of your pet's cage to the other to form a platform or hammock. * with one end attached to the roof of the cage and the other attached to the side. * hanging straight down from the roof of the cage to form a great climbing wall. Or use two or more, separately or joined together, to create the ultimate assault course! Approximate size 30cm x 20cm.